After the clear manipulation of the Synod on the Family in 2014 and now the news of 'Remaining in the Truth of Christ-gate', how on earth is any Bishop or Cardinal attending the Synod in 2015 expected to believe that their contribution - in a spirit of 'collegiality' - is going to be welcomed or valued one iota? The 'will of the people' attending has already clearly been decided long in advance. If I was a Bishop or a Cardinal I'd be thinking that this whole thing is a farce and a bit of a joke. And it is. After the news of the flagrant theft from the mailboxes of Bishops and Cardinals of the book laying out the many theological, doctrinal and pastoral problems with the Kasper proposal, a decision taken in case, Heaven forfend, prelates should walk into the Synod Hall with a fully equipped and informed mind prepared for discussion, are those attending in October really going to be attributing such events to the inspiration of the Holy Spirit? They are expected, are they, to believe that these unexpected 'surprises' are coming from God? Are Cardinals and Bishops to be treated as complete fools? Is this 'synodiality'? Perhaps by the time we get to October, the strange and shadowy syndicate pushing for Kasper's proposals, perhaps even the Pope himself, will have alienated every Bishop and Cardinal but those 'on side'. i gather that copies of the New Testament were also locked away, so that the Synod could be unduly affected by any of its teaching. You're right. They're making fools of themselves. The Kasperites are hooting themselves in the foot. One can hope that all these machinations will contribute to the good bishops emboldening themselves and defending, dogma, doctrine and the Magisterium at the upcoming October Revolution, er, Synod. With the Bishops defending Church teaching, then, and only then will it be a Synod of the Holy Spirit. The infiltration by Satan and his minions is so widespread and powerful, and accepted as normal and good by the brainwashed, corrupted masses, that there is no longer any need to hide. They can be public about their evil doing with impunity. Blessed Michael, the Archangel, defend us in battle . . .
And yet! I think we must not be too dismayed about what happened at the Synod. If you read ALL the documents one gets a slightly different view. The key ones are the first and second Relatios Post Disceptionam. The first one was a disgrace and represented the Kasperite lobby. However the second Relatio completely rewrote the text and it is almost entirely in line with the teaching of the Church. It is interesting to look at the voting on each clause and it is clear that an overwhelming majority voted in favour of the orthodox teaching. The support for the Kasperite lobby is at most somewhere around the thirty level and it therefore received an almighty defeat. This second Relatio is the programme for the rest of the Synod. The problem with the Synod was that the Kasperite attempt at hijacking it was a terrible distraction from the important work that needed doing and everything else was neglected. A great deal of work needs to be done to put this right for the next session besides prayer and fasting. But let us not panic. Even if the final synod document were to go against the teaching of the Church it has no authority to do so. 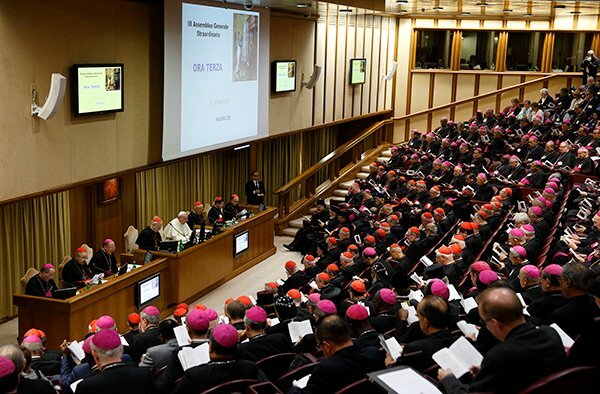 A synod does not have infallibility. It would then depend upon what the Pope says and does. Trust in the Holy Ghost! The whole Synodal situation has been utterly scandalous since the opening salvos last February. And Lynda is on the ball too - the public nature of these things demonstrates the very late stage that has been reached in the spiritual battle. There needs to be a criminal investigation into the removal of these books. Orthodox cardinals and bishops need to demand that the Church's doctrine be publicly affirmed by Pope Francis as a matter of urgency. They also need to demand that new men are chosen for the administration and publicity of the Synod - Men with a proven track-record for honesty and orthodoxy. Keep close to Jesus and Keep the Faith! Our Lady of Fatima - Pray for us. The Seventh Commandment is still doctrine, but is now being applied in a "pastoral" way. Roberto de Mattei's book "Vatican II: The Untold Story" documents the process of similar machinations and forgone conclusions arrived at 50 years ago. The process was eerily similar to what we saw last October and provides a preview of things to come. I highly recommend de Mattei's book. Yes, the second session is building up to a crunch. It had to happen sooner or later I suppose. We will all have to decide whether Catholicism is Truth, or whether it is but a relativised code to get though life, whatever life, or our personal inclinations, turn up. The tactics used by the Relativists so far have been such as would make a professional politician blush for their crudeness, let alone their heresy, but on the other hand they worked surprisingly well during and after Vat II so its no wonder they are being tried again. But the line is now drawn, with a somewhat more aware laity, if not Hierarchy, and we will all have to decide which side of it we stand on. Oh we do live in interesting times do we not? @Nicholas: The admixture of a little bit of authentic faith to make the spoonful of mostly moderninst tripe go down continues. It is not a good that so long as something...anything seems authentic then all the poison getting the green light doesn't matter. Christ was very clear about mixing lies and truth - He doesn't, His Church doesn't, if those claiming the Church do, they are liars and are outside of His Church. 'What concord has Christ with belial, lies with Truth?' None. In matters of Faith and Morals the Church is divinely protected from spreading falsehoods and/or leading people astray. A so-called church that is happily spreading falsehoods and leading people astray is not the Catholic Church no matter how much it may the semblance, and it is a great shame the we Catholics truly believe the Bride of Christ is now able to teach lies because of the times we happen to live in. Kasper is not Catholic and neither is Bergoglio ("Alessandro Gnocchi, former contributor to Radio Maria until he was fired for criticizing Francis — has come out and stated bluntly that Jorge Bergoglio is simply not a Catholic and that he is in fact destroying the Catholic Church.") http://www.novusordowatch.org/wire/index.htm#.VO_rES7sdOU Not really a surprise but not something widely reported. I would add he is trying to destroy the Catholic Faith to which is does not belong from the ramparts of the Novus Ordo attack station. For those who have had their inoculations against Novus Ordoism, Bergoglio and his real brethrens' attempts to undermine, pervert and put to death the authentic Faith in the hearts of Catholics is simply a sad spectacle, it can pose no real threat. But for those who haven't - the damage continues. Based on Cardinal Marx's recent statements, even if the revolutionaries don't have a majority at the Synod, he seemed to suggest the Kasperites will try to get the Synod or the Pope to set up a commission to "implement" the Synod's resolutions, where they can do an end run around the doctrinal issues. In addition, the German bishops are apparently going to do whatever they want in this area anyways, doctrine, Synod and Vatican be d***ed. The divisions evident under this papacy make it all too clear just what a great Pope Benedict XVI was (is?). Far from being divisive, he reached out to all the marginalised sections of the Church whilst everyone knew exactly where they stood in the centre. We must remember this isn't as bad as many previous occasions in Church history, but still, I miss Papa Benedict and look forward to more Catholic times. Viterbo: Perhaps you could point me to what you regard as Modernist tripe in the second Relatio which is now the Lineamento for the second session. There are one or two bits to which I object but the vast majority seems orthodox to me. We need to identify the unorthodox bits and try and get them corrected. Charles G: As I have said even if we get an orthodox result from the Synod in the end it is going to depend upon what the Pope does next - that is where a very real potential danger lies. We do not want a repeat of what happened after Vatican II. In the meantime we need to be specific in our criticisms of the Lineamento saying which particular text needs amending at the same time pointing our the many omissions as Voice of the Family have done in their submission. The whole reason for, and purpose of, the Synod was to further corrupt true Faith and morals throughout the Church. Diabolic. Tee hee hee! I'm going to borrow that! !